We recently equipped the Bangi Field Station with a multimedia projector and a screen in order to allow the graduate students and faculty of ASAFAS to arrange study meetings or workshops at the Field Station. At ATMA, I had discussions with Prof. Shamsul Amri Baharuddin, and Prof. Ding Choo Ming regarding further collaborations between ASAFAS and ATMA through the activities of the Station. 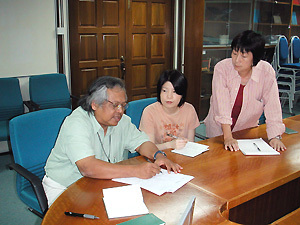 Three ASAFAS graduate students, Ms. Motoko Kawano (year of enrollment: 1999), Ms. Yuko Kato (year of enrollment: 2000) and Mr. Daisuke Naito(year of enrollment: 2003), used and jointly maintained the facilities of the Field Station, while conducting fieldwork in Peninsular Malaysia. Ms. Kawano is now carrying out field research on “historical dynamics of the development of small-scale fisheries and ethnic relations during the New Economic Policy” in Terengganu, with funding from the COE program. Ms. Kato has just launched intensive fieldwork on “a social history of childbirth practices in rural Malay villages” in Selangor. Mr. Naito completed a preliminary survey on “the forest certification system and its impact upon an Orang Asli community” in Negeri Sembilan. During this trip, I met Ms. Kawano and Ms. Kato and received news on the progress of their research. We held a research meeting to discuss the methods and techniques for compiling socio-economic data on rural villages in Malaysia. I provided technical advice regarding the data management and computer-assisted map-drawing. 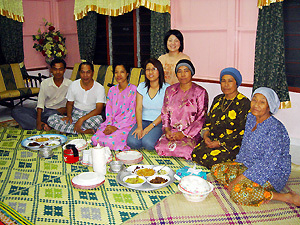 We also visited the research site of Ms. Kato in a Minangkabau-Malay village in Hulu Langat, Selangor and had a talk with her host family. I conducted a brief interview on the migration history of the family and the current medical situation in the village. Together with Prof. Shamsul, we held a study meeting at ATMA and discussed issues concerning local administrative systems in Malaysia. At the meeting, Prof. Shamsul kindly presented a lecture on how to investigate the Malaysian administrative systems. It is no doubt necessary and meaningful for us to exchange our research experiences and findings with our Malaysian counterparts. I consulted young researchers at ATMA about the possibility of organizing cooperative workshops in the next fiscal year.